Alan Richard Norman passed away at 13:00 on January 30th 2017 following an eighteen month battle with brain cancer. Volume Five may well be up by the middle of next week, so be warned. Volume 3 has now landed at Bandcamp (HERE) so get across there and grab it as soon as you can :-) Feel free to name your price – just like the other volumes. There are a few more volumes of these on the way. Most likely not until the end of September or into October. But you never know – it just depends how industrious I become – and what uploading stuff is like at my new place. So far it’s been generally ok but it can be a bit hit-and-miss now and again even getting online, as I’m sharing a wireless connection with several other people. Links to all tracks can be found on the Bandcamp page – and all the usual pricing is available. This time, it’s with another A Plot Of Knives album. This one is called Survivalist’s Tower (Statled Okapi! Recordings No. 22) and can be found right HERE. So, here it is – at last. This is the first in a series of albums containing tracks named after objects in the Asteroid Belt. There is a second volume already waiting to follow this one and there will be more forthcoming in time. The numbers at the start of each track are sequential numbers, which are assigned to the asteroid once it’s orbit is secured – the name often follows much later, sometimes after a long period of debate. Each of the 18 tracks has a few notes attached to it regarding it’s Astronomical Namesake and the origin of it’s name – if it’s known of course. Get it HERE – usual pricing structures apply and the whole thing can be previewed there as well. Now back as SO! No.19. and available here as of now, with the usual price structure, of course. And some decent-quality soundfiles available as well, for those that desire them. This originally came out back in October 2010 and was one of three albums that were released online that year, you can preview it all at the Bandcamp site. Also at Startled Okapi! now is Arctic Circles, another album by A Plot Of Knives – one of many recorded during 2013 that will pretty much all see the light this year, depending on circumstances. My internet connection here is still spotty and I’m looking at alternatives right now. 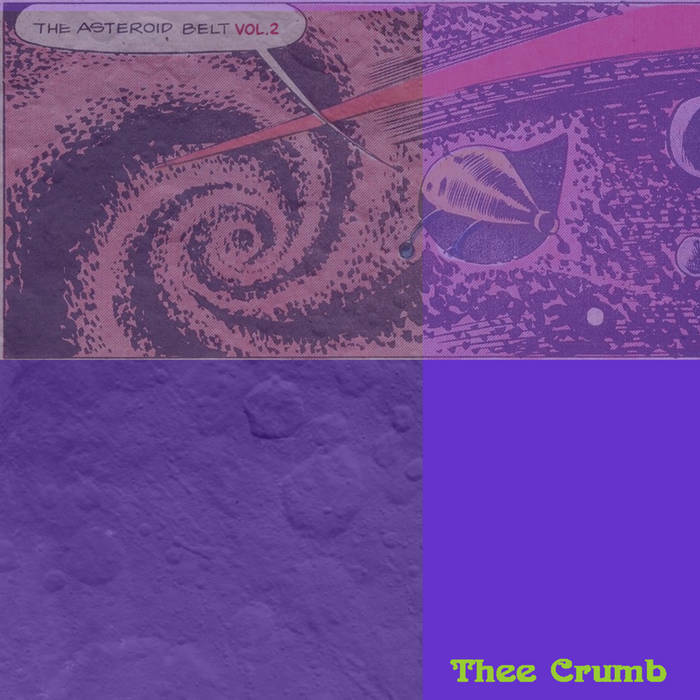 There will be more Thee Crumb online soon as well, not just the long-promised first of the Asteroids albums but at least one other new release too, which will be up early next month. Here I am again, posting a progress report at the start of yet another month. Well, I moved out of the place I’ve been staying at since last September and am now living in a small flat in Bournemouth. It’s all very relaxed – in fact you’d hardly know there was anybody else living here. The only problem so far is access to the internet – I’m on a shared wireless network here in my attic flat – which is spotty at the best of times and may seriously hamper efforts to upload music. We shall see how it goes. However, I’ve already got 3 more albums ready to go at Bandcamp, as I took the chance to upload them before I moved. There are 2 Thee Crumb albums (a reissue and a new one) and another APOK album. All of these will go live in the next couple of weeks. After that, we’ll see what happens. All my musical kit is set up here and I’ve been hard at work, partly going back through a lot of old, unfinished tracks and sorting them out and partly writing a good number of new Asteroid tracks. I expect to have the first volume of them live (depending on the upload situation, of course) fairly soon. Originally recorded for the RPM Challenge back in February 2008, and then issued on Hallo Excentrico! later the same year. And now it’s back again on Startled Okapi! Here. With a couple of bonus tracks not available on any other version of it, firstly Rodents Probed Melanie, which was released as part of the Roughly Produced Masterpieces by Very Us Artists, which was another RPM contribution from the same year, which started my association with Very Us Artists which eventually led to Foreshadows. The other bonus track, Uppercrust, is an early version of Ghosts Of Horses, which I found recently in the original files for this album and had never previously made public. You’ll need to download the entire album to get these two. The only other out-take from the album was Cradle, which was later released on the first Catacombs album. Ana all being well, there ought to be another Catacombs albums along early next year. The plan is, as I’ve mentioned before, to have all the albums up at Bandcamp so they can all be found in one place. There are a few more reissues planned for later on this year, as well as a couple of new albums. In fact, they may well be a new album up this month. But as I’m looking at moving sometime in the next few weeks all plans are provisional. While I’m here, I should also mention that A Plot of Knives now has its own Bandcamp page and there’s already a release there. The Footprints Ended In The Middle Of The Field – which was recorded during June 2013. Once again, the plan is to add all the albums to this page – there’ll be should another within a couple of weeks – and at some point, I’ll add a separate page here for APOK as well as a discography. Everything on here was recorded between December 2014 and May 2015 and was lined up to be released sometime in July or August last year before other events got in the way. I’ve posted a couple of these track on here before but full-length previews can be had on the Bandcamp link above. And yes, Waves At Pevensey Bay is an accurate description of the contents of that track. Following this, I’m looking at releasing few of the older previously-unissued albums and putting most if not all of my other albums up at Bandcamp too, not to mention a few oddities. More on this when it actually happens.